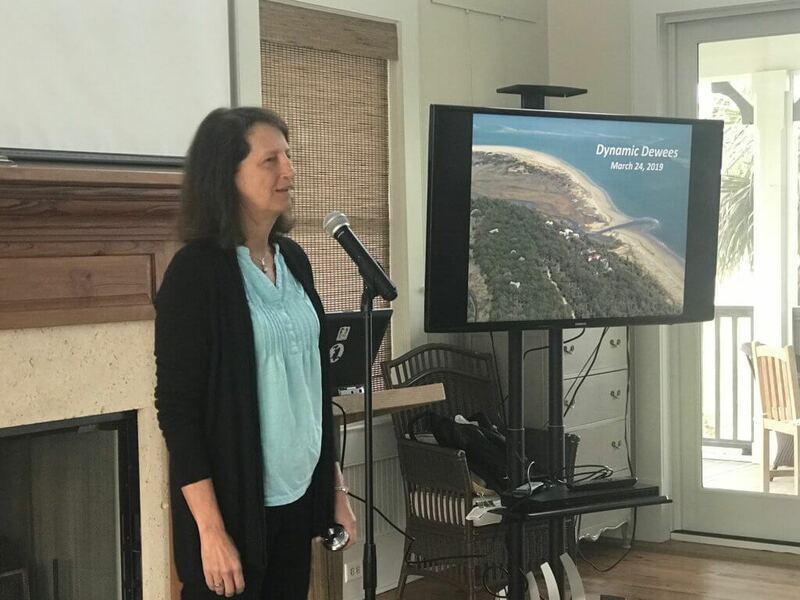 Last week at POA weekend, Dr. Leslie Sautter came to Dewees and gave a great presentation on the history of our shoreline, changes to the front beach, and suggestions for ways to address the new inlet into Lake Timicau. As usual, she was both informative and entertaining. I tried to add her slides and illustrations into the videos: I recommend starting at the beginning and watching them in order. She comes to us not as a consultant but as an educator providing some framework for us to address with consultants. She started with some historical data that she gathered using Google Earth. Since 2006, her students have done surveys, but the Google Earth tools allow some different perspectives on the shoreline. Overflights and drone photography have made even more research possible. This first video begins with a general discussion of shoreline change and coastal processes. The second video discusses geomorphology, or how the beach changes. From ebb tidal deltas, to swash bars, to updrift and downdrift, she gives us some geological terms and illustrations of what is happening in Capers Inlet, and how that affects how much sand we have on the beach. The third video discusses how shoals form, and how that changes the directions that the sand moves on the beach. Sand can build, creating a tombolo effect, which is what happened on Dewees in the 2000’s. 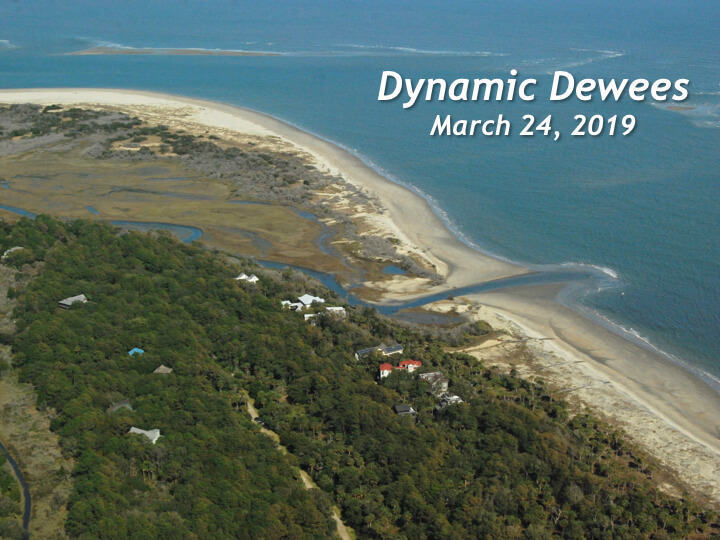 The fourth video looks at the specific changes on Dewees in terms of shoreline and the main channel, including previous breaches from Hurricanes David and Hugo. In this fifth video, Dr. Sautter looks at the historical changes in Lake Timicau and the ocean shoreline, looking at the natural flow of water in that area. Here, she looks at the current breach situation, the way it is changing every day, and some possible solutions we might explore going forward. In the 7th video, Dr. Sautter looks at the current patterns of water in Lake Timicau. She shows us several possibilities for encouraging the water to go further north than the channel currently goes. Kiawah uses a similar “soft solution” for managing their shoreline. 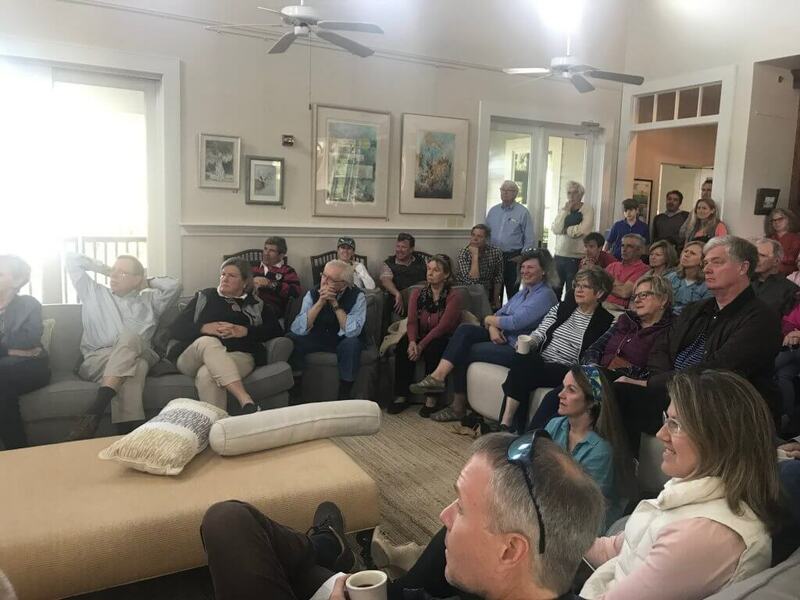 This video concludes Dr. Sautter’s lecture to the Dewees community on March 24, 2019. She continues looking for alternate water areas. Some questions and answers are included. How will ecology change? Can we keep the area impounded? Will sand fences make a difference?